Born in northern California, Romeo enjoyed life with his mother, father, and three bothers in a town known as Crescent City. During his move into kindergarten, Romeo moved south towards California, and lived there for most of his life, and it was there where he developed an interest in drawing cartoons and different types of super hero characters. He participated in an art contest at the age of 6 and won 1st place! This excited young the young child. For a while. Then, life begins. Aside from a few drawings and attempts at adding color to a surface; not a single piece of artwork was made by the young adolescent. It was only after graduating high school, and attending college in the Ventura County area that Romeo renewed his attraction for the arts that he participated in his first course in Drawing & Composition with master artist Frank Sardisco. Long after that encounter Romeo found himself attending, and participating in different artistic events around the Los Angeles area, and venturing in his very own co-op art gallery perfectly named CARPE ARTE Gallery, with longtime acquaintance and confidant Appelusa in the NoHo arts district, North Hollywood California. After a few years, during a reception. Romeo took an interest of a women walking by the gallery whilst on vacation, and inviting her in. They fell in love and flew to her home town in Denmark, and it is where he resides today. He is currently active in the arts, and is a member of the Vallensbæk Kunstforening an art associated in the same town. contact him! 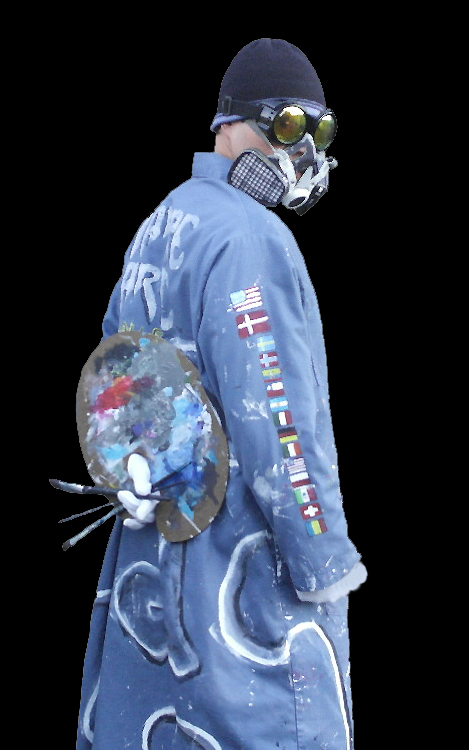 You can find Dr.V live/action paint around town or at other events in Denmark. Just check out our N.E.W.S. section! The flags along his sidearm are from the individuals from their respective countries of which you may be able to view artwork from the artist. So welcome! We are happy that you landed into the world that is deliciouspaint. Don’t be affraid. Embrace art. Finally, paint that looks delicious!